Getting the right size machine screw for your project can be a frustrating experience. Not only do you need to know the diameter and length of the screw, you also need to know the thread pitch, or number of threads per inch. 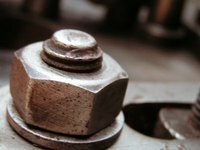 Screws of the same diameter with a different thread pitch are not interchangeable, and may damage the tapped threads in a nut or hole if you try to force it to fit. Fortunately, there is a simple method to determine which machine screw you need for your project. Measure the diameter of the screw’s shaft with your calipers. Machine screws are manufactured with tolerances measured in thousandths of an inch. Simply holding the screw against a tape measure or ruler may not give you a measurement that is accurate enough for a proper fit. Place the shaft of the screw in between the jaws of your caliper, tighten them until they rest firmly against both sides of the shaft, and read the measurement off the caliper’s dial. Measure the thread pitch with a thread gauge. A thread gauge resembles a spark plug feeler gauge. It will have multiple metal leaves with serrated edges. These edges are designed to match the thread pitch and depth for standard machine screws. Hold the screw in one hand while trying the edge of your thread gauge against the screw with your other hand. Again, these tolerances will be close, especially on smaller screws. Hold the gauge and screw up to the light. The gauge leaf that fits will allow no light between the screw’s threads and the serrated edge of the gauge. The gauge leaves are marked individually with the thread pitch. Measure the length of the screw with a ruler. Flat head machine screws are measured from the top of the head. Screws with round or hexagonal heads are measured from the bottom of the head. Machine screw dimensions are given with two numbers separated by a dash. The first number indicates the screw’s diameter the second indicates thread pitch. A screw labeled "3/8 – 16" will have a diameter of 3/8 of an inch, with 16 threads per inch. A leading single number in a screw’s dimension designates a screw less than ¼ of an inch in diameter. The American National Standards Institute, ANSI, lists these as follows: 0 designates a diameter of 0.0660; 1 designates a diameter of 0.0730, 2 designates a diameter of 0.0860, 3 designates a diameter of 0.0990, 4 designates a diameter of 0.1120, 5 designates a diameter of 0.1250, 6 designates a diameter of 0.1380, 8 designates a diameter of 0.1640, 10 designates a diameter of 0.1900, 12 designates a diameter of 0.2160. These diameters are given in decimal fractions of an inch.